In Bariatric Surgery Criteria and Weight Loss, we discussed the criteria for qualifying for surgery. Now we’ll discuss bariatric surgery procedures. If your doctor advises it and you are accepted for surgery, a decision to accept the surgery should not be taken lightly. Don’t believe surgery is a magic wand and the cure all of your obesity. A complete change of lifestyle isn’t an option, it’s a necessity. Committing yourself to the before and after program devised for you by the bariatric surgery team is essential if the surgery is to be successful in the long term. There are various types of bariatric surgery that can be performed. This will depend on how the surgeons assess your suitability and decide which is best for you. Now let’s take a look at what the different types of surgery are. 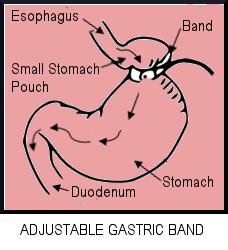 Also known as Lap Band Surgery, an inflatable band is placed around the top of the stomach, creating a small stomach pouch, the opening of which can be reduced gradually to restrict the amount of food consumed by the recipient. This is done by placing a port just under the skin, by which the addition or removal of saline can be controlled. This, in turn, satisfies the recipient’s feeling of hunger quicker and reduces the number of calories consumed, a major factor in weight loss. Once the food has passed from the small stomach pouch into the stomach below the pouch, it is digested as normal. Like every form of weight loss surgery, gastric banding can have side effects, the most common being vomiting, caused by eating too much food too quickly. Normally, one of the safest types of weight loss surgery. Can, in many cases, be carried out using laproscopic (keyhole) surgery. Low rate of serious complications and is the only surgery that is completely reversible or adjustable. It is much less invasive than other forms of bariatric surgery. Has the lowest malabsorption rate of vitamins and minerals than other forms of bariatric surgery. Shorter stay in hospital than other forms of invasive surgery, often less than 24 hours. Weight loss is normally slower and usually less than other types of bariatric surgery. Many patients lose less than 50 percent of their excess weight. It is possible that a person may regain some of their weight over a period of time. A small number of patients may have problems with the band slipping or eroding in the stomach. During the next 2-3 years up to ten visits or more to your doctor or clinic may be necessary to adjust the band. Band Erosion. This necessitates complete removal of the band. Band Infection. Can be treated with antibiotics but removal may be necessary. Band Intolerance. This could be due to the body rejecting a foreign body, excessive vomiting or constant feelings of discomfort, removal is the only answer. Band Slippage. Caused when the lower stomach slips through the band, enlarging the small stomach pouch above the band. Normally repaired by drawing fluid off the band or surgically re-positioning it, although removal may be necessary. After the surgery it is of the utmost importance that post-operative diet and post-operative appointments are strictly adhered to if it is to be successful in the long term. That’s about it for the Adjustable Gastric Band, now let’s take a look at Vertical Banded Gastroplasty. Also known as “Stomach Stapling”, the amount of weight lost is less than with other weight loss surgeries, and is not performed as much as it used to be. VBG is a restrictive technique that limits the amount of food that can be eaten at any one time and slows down the passage of the food. This is achieved by creating a small stomach pouch using staples and a band made of special material. 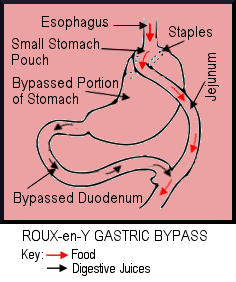 Where the esophagus enters the stomach, using staples, the stomach is stapled off, creating a small stomach pouch, which restricts the amount of food that can be eaten at any one time, and makes the patient feel fuller more quickly. A band is then placed at the bottom of the small pouch, creating a hole about one centimeter, which allows the food to slowly enter the main stomach and into the gastrointestinal tract to be digested as normal. This does not affect malabsorption and calories and nutrients will still be absorbed from the food eaten. To reduce the amount of calories and nutrients absorbed (malabsorption), stomach stapling is combined with gastric bypass surgery such as the Roux-en-Y gastric bypass surgery, but more about this later. As with every type of bariatric surgery, vertical banded gastro-plasty has its advantages and disadvantages. Below are some of them. If needed, can be converted to gastric bypass or duodenal switch. Absorption of vitamins and minerals reduces the risk of malnutrition. No dumping syndrome, ie, nausea, vomiting, bloating, etc. No cutting, so the body anatomy remains intact. Can be carried out by laproscopic surgery. If reversal is necessary it can involve complex and invasive surgery. Serious infection can be caused if digestive contents are leaked into the stomach through impaired staple lines. Strict adherence to diet is a must if surgery is to be successful in the long term. Weight gain may ensue if the band slips, breaks or becomes dilated enlarging the opening to the stomach, allowing more food to be consumed. Food eaten too quickly or not chewed properly can result in vomiting. May find difficulty in eating high fiber foods. Vertical Banded Gastroplasty surgery may result in less weight loss than with other forms of bariatric surgery. That covers banded surgery, now we’ll take a look at gastric bypass surgery and what is available. The most common form of gastric bypass surgery to help weight loss is probably the Roux-en-Y (RNY) method. As well as stapling it involves more invasive surgery than the previous examples. In the last ten years, of all the types of bariatric surgery types tested, the gastric bypass is seen as the most effective in the amount of weight lost, both short and long term, has relatively low instances of compli­cations while gradually improving or eliminating many obesity health-related problems. 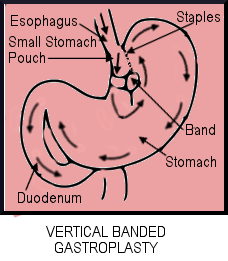 As with the two previous examples, a small stomach pouch is created by cutting and stapling both sides of the separated stomach where the incision has been made. The small intestine is left attached to the rest of the stomach, it is then cut further down and attached to the small stomach pouch. The end of the small intestine that is still attached to the remainder of the stomach is then attached to the small intestine further down, this allows the digestive juices in the stomach to meet with the food from the small stomach pouch to aid digestion. Like all weight loss surgery, the gastric bypass can have side effects, the most common being known as the “Dumping Syndrome”, which has both early and late side effects. Let’s take a look at the early dumping syndrome first. Many of these symptoms may be alleviated by following a few recommended simple aftercare dietary rules: Don’t eat your food too hot or too cold; don’t drink fluids thirty minutes before, during, or until at least thirty minutes after a meal; avoid foods that are high in fat and carbohydrates, particularly simple carbs, which are sugars. Now we’ll take a look at late dumping syndrome. Why late dumping syndrome? As opposed to early dumping syndrome, which occurs within thirty minutes of finishing a meal, late dumping syndrome, a form of low blood sugar (hypoglycemia), caused through consuming to much sugar which cannot be digested properly because of a smaller stomach, and occurs between one and three hours after finishing a meal. Mental Changes (which can include problems concentrating and/or feelings of confusion). Weight loss can be quite quick and dramatic over 18-24 months. In many cases, patients will find they maintain 60-80 percent of weight loss over a period of ten years. The contents of this article is for information only and not meant to advise or recommend bariatric surgery. If you feel surgery may benefit you, please consult your medical practitioner who, after consultation, may refer you to bariatric surgery specialists for assessment as to your suitability for surgery.